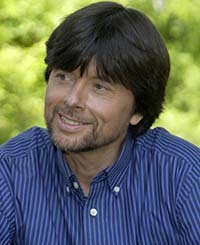 Since 1981, Ken Burns has been among America’s most compelling storytellers and influential filmmakers—directing and producing some of the most richly acclaimed historical documentaries ever made. Honored with multiple Emmy Awards and a Lifetime Achievement Award from the Academy of Television Arts & Sciences’ News & Documentary Emmy Awards, Burns regularly creates “heroic television” (The Washington Post). His diverse stories of suffering and triumph, perseverance and folly, and what it means to be American provide rapturous portrayals of history’s human dimensions while displaying an encyclopedic breadth of knowledge. Thanks to Burns, millions of viewers worldwide have engaged with leaders, explorers, artists, athletes, innovators, and icons in insightful, entertaining, and illuminating ways. In a lecture titled The American Experience, Burns will remind us yet again of history’s timeless lessons, as well as the enduring greatness and importance of the United States in the course of human events. Incorporating elements from his landmark trilogy—The Civil War (1990), Baseball (1994 / 2010), and Jazz (2001)—Burns will engage and celebrate our many commonalities, and offer further opportunities to reflect on our nation, our achievements, and ourselves.